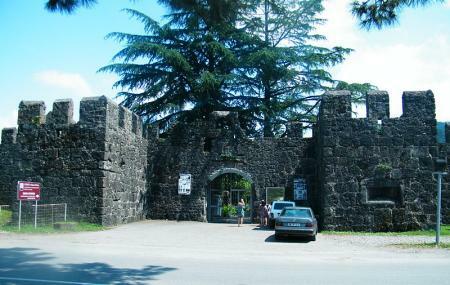 Perched at a distance of 15 kilometres to the south of Batumi, the Gonio is a fortress which is actually a Roman fortificationat the mouth of the Chorokhi River in the village of Adjara. This is where you stand at distance of 4 kilometres from Turkey! Historically known for its rich theatre and hippodrome, you will find several instances that give you this realization. Additionally, this attraction also accommodates one of Christ’s disciples’tombsnamed Apostle Mathew. The striking architecture with its rectangular shape and a gate on each side with vigil towers is what you will notice as soon as you enter this place. Erstwhile archaeological excavations show suggestions of Roman baths, water supplies and roads that date back to the 1st A.D. century. To provide more information about the attraction’s history is the museum housed inside the fortress. People normally club together Tbc Gallery and Batumi Aquarium while planning their visit to Gonio. I had a fun time climbing around on the walls. Cool place totally enjoyable. Very nice historical place. Would be nicer if they could clean the garbage left by previous visitors. Not very much what to see, maybe at summer is more beautiful. It's has fortress walls.. archelogical exploration is still under progress. You can go near to that exploration and watch. All excavated materials are kept open, you can touch lift.. no restrictions. One time visit. If you have free time.